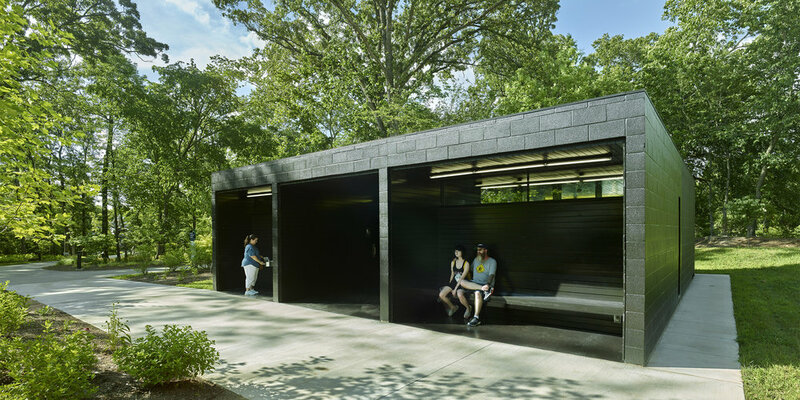 The North Trail Biological Pavilion is a highly functional addition to a new sculpture and architecture trail at Crystal Bridges Museum of American Art (CBMAA). It adds conditioned bathrooms, drinking fountains, seating, and maintenance facilities to support seasonal outdoor programming. The project was driven by the belief that the facility should aid the CBMAA’s aspirational mission, which seeks to integrate art, architecture and nature. The building upends conventional approaches to public hygienic facilities by staging dramatic experiences of light and seasonal change — its dark interior selectively allows light in, and the experience is heightened through a focused engagement of color, sheen and reflectivity.